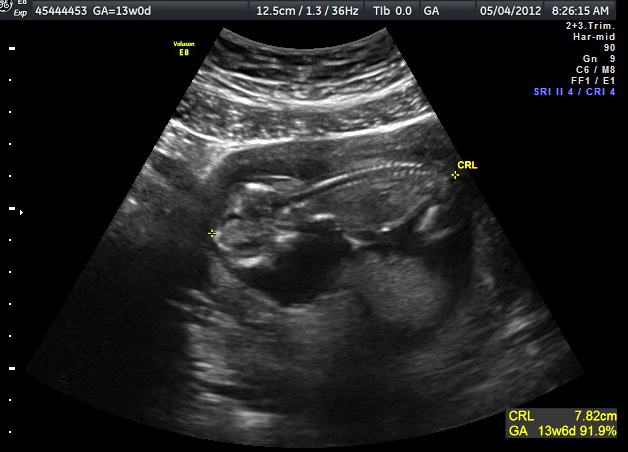 We had our nuchal scan ultrasound and blood work today (13 weeks). According to my "what to expect" iphone app I am now in my 2nd trimester, others say at 14 weeks, and my day calculations tell me I will be on Monday...confusing. I have a hard time looking decent in the mornings because my blood pressure stays somewhere around 90-something/ 50-something so I am pretty dizzy almost every morning...so my belly picture and update (not much has changed) will have to wait until tomorrow. After hearing the healthy heart beat at my doctor's appointment yesterday I was all excitement, no nerves. This ultrasound is actually to check for some serious stuff, but getting another chance to see the baby is definitely a plus. 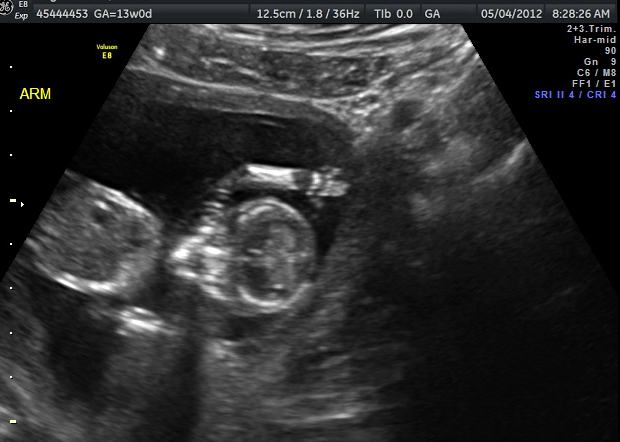 Our appointment was at 8:30, and when we started the ultrasound the baby was in a ball (it needs to be straight out to be measured)...and it needed to turn to give us a profile view, face up. That stubborn (totally my kid) little thing would NOT move. 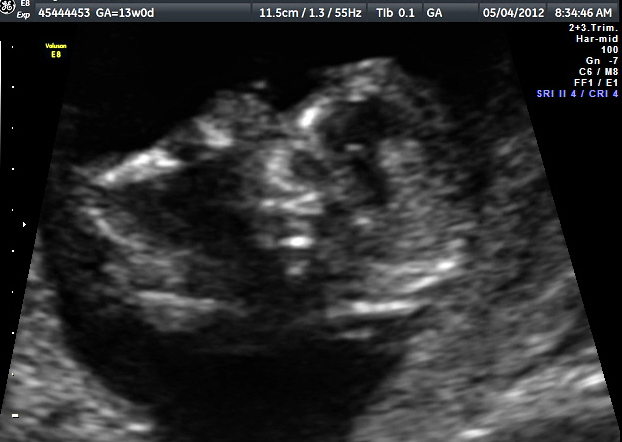 I was coughing, laughing, turning to my side...the ultrasound tech was pressing on my stomach over and over...it was just laying there with a healthy heart beat (152 bpm). Apparently, it was too early in the morning for our little one to wake up (again totally my kid)...finally after about twenty minutes it woke up and started moving. Baby, if you want to keep sleeping late...I am all for it :)...it seems as though architecture school didn't just affect my sleep schedule haha. The best full body shot we got...you can see the legs, head, spine, etc. The doctor wasn't concerned with the appearance of the baby's nuchal fold (it looked normal) and it looked to have a nasal bone, so he is positive about the outcome of the tests. I won't know the actual results for another week or two (please pray for good results)...and if it is good then I will not be doing anymore tests for down's syndrome or the trisomy's. I will have another blood test and scan for spinabifida (the one that worries me more) at a later time, but he said most of the time if it is bad spinabifida they could see it here. The profile, arm, and hand...not as clear as when we saw it though. The two parallel white lines behind the neck are what gets measured in this screening.